Stay Gulf front on your next Fort Walton Beach vacation at Dune Pointe. These Florida vacation condo’s sit directly on the beach. Wake up to beautiful views over the emerald green waters and start the day with a morning stroll along the white sandy beach that sits right outside your door. After long beach days in the sun, take a refreshing dip in the community pool or relax in one of the pool side lounge chairs. The pool is surrounded by a large sundeck, giving you room to hang out while the kids splash away in the water. Okaloosa Island offers endless activities for your vacation. You will not be short on adventure when staying at Dune Pointe. You can rent paddle boards, parasail, fish, ride jet skis in the Gulf and much more! The Gulfarium Marine Park is near by and there is also endless restaurants. Destin is just a couple minute drive over the bridge and offers a world of attractions. 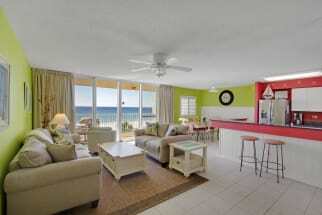 Plan your next vacation to Dune Pointe in Fort Walton Beach, Florida directly with the condo owner. 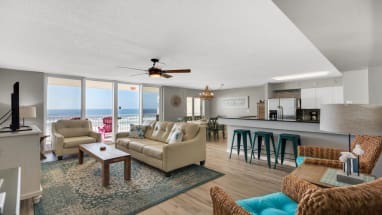 Browse our selection of Dune Pointe Condo rentals below! 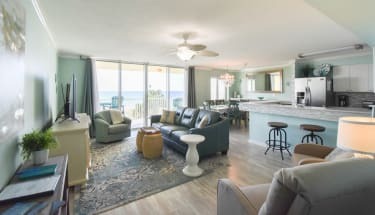 Emerald Coast By Owner puts you in direct contact with vacation rental owners and assures you are not paying any booking fees. We hope you enjoy your trip to Dune Pointe!